Publication year from this copyright page statement: "Printed in Germany 1985". Month of publication from Science Fiction Times, August 1985 (Heyne preview). 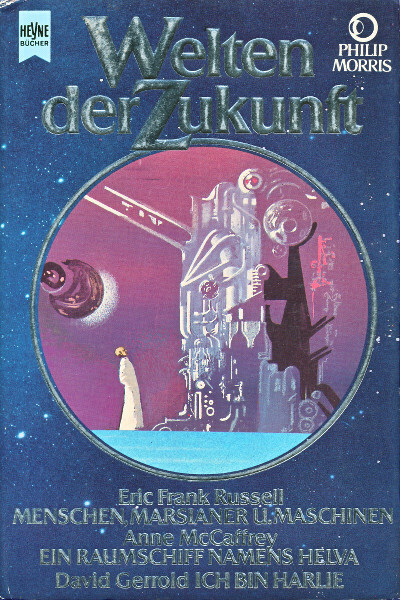 "Men, Martians and Machines" translated by Walter Brumm as "Menschen, Marsianer und Maschinen"
"The Ship Who Sang" translated by Birgit Reß-Bohusch as "Ein Raumschiff namens Helva"
"When Harlie Was One" translated by Charlotte Franke-Winheller as "Ich bin Harlie"
All novels in this omnibus were previously published in the publication series "Heyne Science Fiction & Fantasy"
The last numbered page is 588. The text of "Ich bin Harlie" ends on unnumbered page .